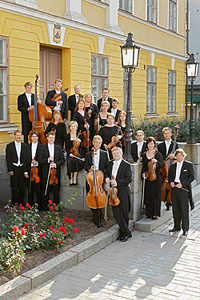 The Ostrobothnian Chamber Orchestra has its roots in the student orchestra founded by conductor and current Artistic Director Juha Kangas at the Central Ostrobothnian Music Institute in 1972. Out of this grew, and took root, the idea of a more permanent, professionally-led and organised orchestra. The dream of a professional orchestra of Ostrobothnia's very own finally came true in 1989. Since then, the Ostrobothnian Chamber Orchestra has been on numerous tours to European countries, Japan and the United States. Its Principal Guest Conductor is Sakari Oramo. The Orchestra's repertoire covers every period in the history of Western music, from the Baroque to the present day. The OCO has done sterling work in championing contemporary Finnish repertoire. Its composer-in-residence for many years has been Pehr Henrik Nordgren, but numerous other Finnish composers have also written for and dedicated works to it. The OCO has had close ties with contemporary composers in the Nordic and Baltic countries. The number of premières, many of them of OCO commissions, runs to nearly a hundred. The Orchestra regularly appears with top international soloists and has released over forty discs in addition to giving regular concerts. The Orchestra was awarded the Nordic Council Music Prize in 1993.